Another one of my mom’s treasures…and old time favorite from my childhood. Please try this simple dish – it will surely satisfy and be easy on your wallet. Fantastic – we’ll post her red cabbage very soon. Preheat to 350 Convection. 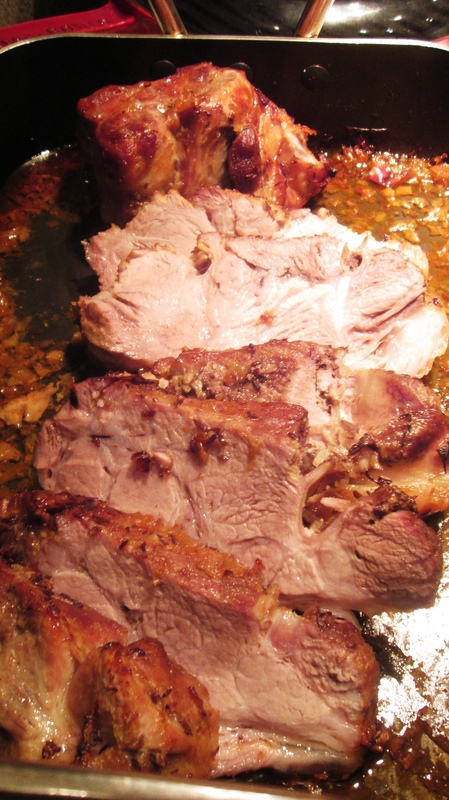 In a roast pan, place shoulder with above spices and add water, cover with aluminum foil. Cooking time is about 2 1/2 to 3 hours. Let cook covered with foil for 1 1/2 hours then uncover and spoon/baste water/juice every 15 – 20 minutes, and turn a couple of times until it’s golden brown and serve as you see fit. We cut it into three chunks so to allow for maximum browning and seasoning. Serve it with some awesome blue cabbage and enjoy. On my list to make for today! Just want to say this was possibly the best pork roast I have ever had. Thanks for sharing the recipe! Does the cabbage include vinegar? I bet that would be a great accent to the roast. How awesome to see your comments! Thanks. 🙂 It is one of my favorites and my mom made it with me, great childhood memories. Yes the cabbage has a tablespoon of vinegar and will be tomorrow morning’s post. Please let me know what you think when you see it. I can attest to how yummy the roast pork and red cabbage is. 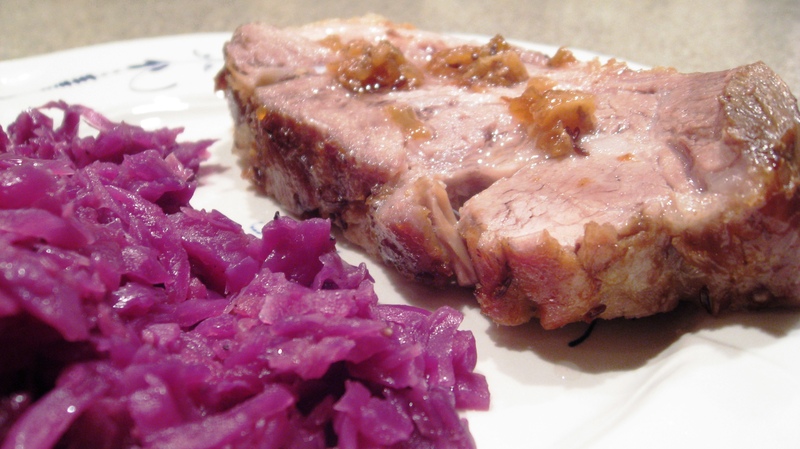 The red cabbage as a side is a must as it’s one of my absolute favorites. Kisses to your momma and kisses to her cooking gifts. Thank you so much Lorena! Can’t wait to see you two!! I’ll pass the compliments to mom. So cook covered for 1.5 hours then uncovered for the remaining 1.5 hours – basting every 15-20 min? Hi Sue, many thanks for finding this error! I fixed it on the post. Total cooking time is 2.5 to 3 hours, cover at first for 1.5 hours then uncover.